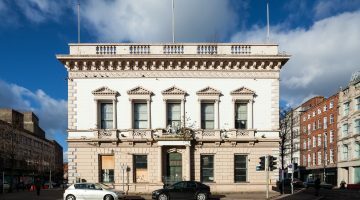 An accurate and appropriate survey of any building is the basis for informed decision -making on a project and is usually the first step in establishing the nature and extent of the work required. 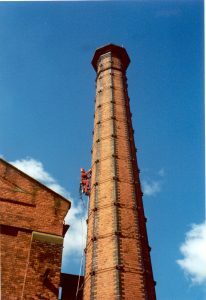 Surveys range from simple recording in plan, section and elevation, to highly technical, non-destructive techniques to locate hidden problems. For most buildings, a traditional, measured survey will be sufficient but care must be taken not to overlook important details. Few old buildings are true and square, and it should not be assumed that rooms are perfectly rectangular – a series of diagonal measurements will give an accurate picture of the real shape of the spaces, both internally and externally. When extensive work is planned, it is important to record the size, shape and location of all interior fittings such as skirtings, architraves, dadoes, cornices and other mouldings. Once demolitions commence it is easy to forget exactly where such items belong: labelling each piece of joinery as it is taken down helps to prevent mistakes later. Rectified, or corrected, photography can be a valuable tool for recording the elevations of large and complex buildings but this has now been largely replaced by laser scanning (LIDAR) carried out by specialist companies and accompanied by a detailed photographic record. The information is stored digitally and used to generate highly accurate drawings in two or three dimensions. Other tools, such as X-ray, infra-red and ultra-sound can be used to detect hidden problems such as voids or corroded metal fixings within the fabric of the building itself. The most common are magnet-based ‘cover meters’ and impulse radar. The successful use of these techniques requires specialist advice, and they are normally only employed on the most intricate and important of structures where the high cost can be justified. However, such costs may be offset by the early identification of problems before they become serious defects, requiring major intervention to remedy. Access for surveying is often a problem and the cost of scaffolding can greatly outweigh the cost of the survey. 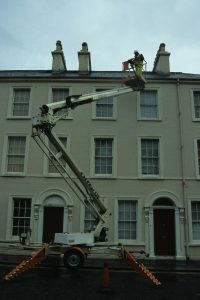 Mobile hoists are in general used, but for very awkward buildings, roped access techniques are often more effective, allowing even the most hidden parts of a building to be thoroughly investigated and recorded.